My family sure was nice to me on my birthday this past Wednesday! One of the gifts I received was something I’ve wanted, but I couldn’t bring myself to cough up the cash for it: the 2012 edition of The ARRL Handbook for Radio Communications, graciously given to me by my daughter. Since the most recent copy on my shelves was several decades old, I was glad to get my hands on it. I can see why this is a required textbook for the classes my friend Scott has been taking. He is a Signalman with BNSF Railway and periodically travels to Kansas City for training (no pun intended). 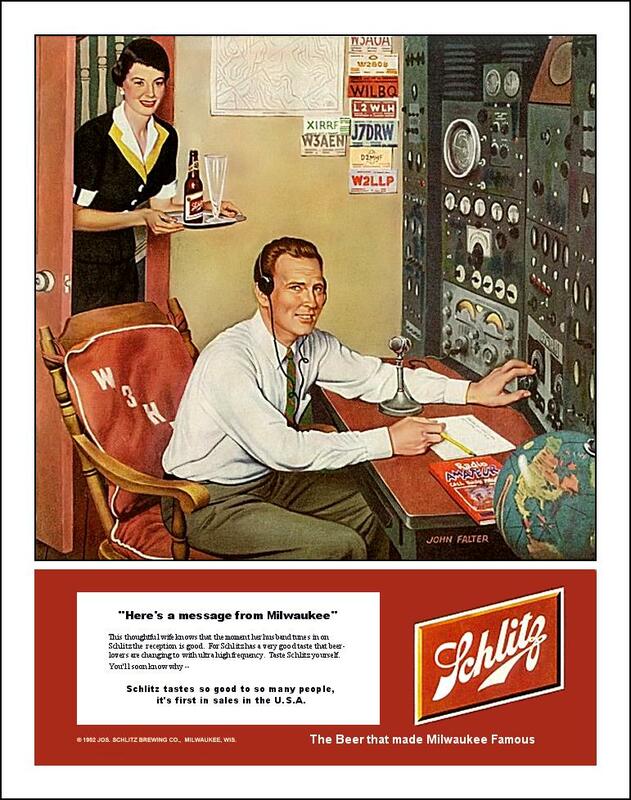 The ARRL Handbook is a great resource for more than just ham radio operators. It is well-written and comprehensive — so comprehensive that I felt like an ignoramus as I paged through it on my birthday! I may have my Amateur Extra Class, but now I see more clearly than ever how little I really know. But don’t let that scare you away from this book, Technicians. There’s still plenty in this book that you will find accessible, and anyhow we’re never going to learn if we don’t push ourselves. One thing that isn’t covered in this book is the topic of operating procedures. But I can see why this topic has been relegated to a book of its own . The ARRL Handbook is quite a hefty tome as it is. As with most of the ARRL library, you’ll find this book cheaper over at Amazon . 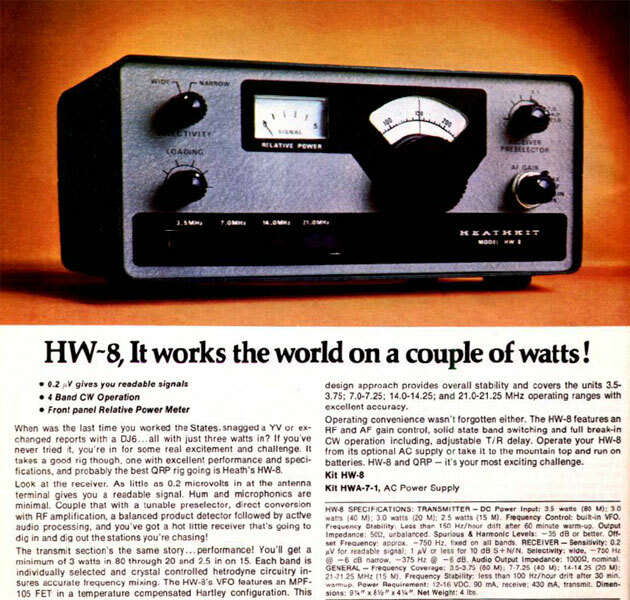 Reminiscing about my early days in ham radio, one of the things that really stands out is a gift my parents gave me 32 years ago — a Heathkit HW-8, an 80/40/20/15 meter QRP CW transceiver! It was an utter surprise to me; I never had the slightest inkling that it was coming. I was 12 years old and had never built anything like that before. How wonderfully mysterious all those parts looked as I pulled them out and set them on the dinner table! Looking back on it now, I realize how patient my mother was to let me take over that table in the dining room. As I recall, I worked nonstop to build the little rig and its power supply. Ten days later, on January 3, 1980, it was finally ready. My dad took a look at it and said it was ready for the “smoke test.” You can imagine how I held my breath as we plugged it in and turned it on. I was waiting for something on the circuit board to go up in a puff of smoke! Nothing exploded, so I was ready to take it into the shack and hook it up to an antenna and straight key. “Ready” is an understatement — I was so excited to get that rig on the air I was nearly bursting at the seams! I picked up the phone and called Dr. Bernard “Bernie” Northrup, KAØDKN, a friend of mine across town, to see if he would get on the air and give me a signal report. Dr. Northrup (later NØCIE, now a silent key) was a professor at Central Baptist Theological Seminary of Minneapolis and a fellow member at Fourth Baptist Church, Minneapolis. Not long before, he had gotten his license after hearing me talk incessantly about ham radio at church (I’m afraid back then I was more interested in ham radio than spiritual things.). Anyhow, I called him (around suppertime, I see by my log!) and he graciously agreed to get on the air. And sure enough, my HW-8 worked! After a half hour with Dr. Northrup on 15 meters I was ready for my first “real” QSO, as I thought of it. Tuning around the band, I heard ZL4KI. My heart started thumping as I prepared to call him. Could he really hear me even though I was sending with no more power than that of a small flashlight? My hand was shaking as I tapped out ZL4KI ZL4KI ZL4KI DE NØART NØART NØART KN and waited, flushed with excitement. I could hardly believe it when I heard my callsign as he came back to me! To think that the signal from this little radio, built with my own hands, was being heard 8,700 miles away in Invercargill, New Zealand! Amazing! Other radios have come and gone, but that trusty ol’ HW-8 is still with me. As a boy I brought it with me to church camp and set it up in the lodge, tapping out CW while the other boys played games. Once on a trip to Louisville, KY I set it up on the second floor of my grandparents’ house — with a TV-twin-lead dipole my father had built — and worked a station in Poland. When I moved into my first apartment as a newlywed, I set it up with that same dipole in my (below-grade!) apartment. On a couple of memorable, crisp, autumn days, I brought it to a local park with a thermos of hot cocoa, sat down on a carpet of pine needles, and thrilled to the sound of soft static and CW. And last summer, when I just couldn’t wait until I got my shack set up at my new QTH, I set it up on the picnic table in my backyard with an OCF dipole tossed into the trees. Even though that antenna was so low its feedpoint rested on the picnic table, I still worked both coasts on 20m with my trusty ol’ Heathkit HW-8! What a great little rig. Thanks, Mom and Dad, for giving me such a great gift! On p. 32 of the March, 2012 edition of QST that came out this week, I am pleased to see a review of The Road Home, a novel written by Andrew Baze, AB8L. Coincidentally my son and I just finished reading this book, and we thoroughly enjoyed it. Despite a few typos and minor grammatical errors (specifically, the use of the indicative mood where the subjunctive mood should have been used), it is very well written. The plot is plausible and captivating. Mr. Baze makes ham radio (2m FM and APRS) an integral part of the story, and he makes it work — it doesn’t seem at all as though he were straining to slip it in somehow. Furthermore he displays a high degree of competence in operating procedures, emergency preparedness, and even defensive tactics. While this book is light reading, there is still some character development of the young man who is the main character of the story. Refreshingly, the boy’s father is his guide (rather than being marginalized or vilified as parents often are in teenage fiction). Not only does Mr. Baze inspire a young person to get a ham radio license, he succeeds in developing the moral imagination of his readers. The Road Home cultivates an affection for such admirable qualities as diligence, perseverance, courage, level-headedness, familial love, compassion, and a chivalric desire to avoid violence yet defend women from evil with deadly force when necessary. You can read this book for free, if you have a Kindle and an Amazon Prime account, by borrowing it from the Kindle Owners’ Lending Library for Amazon Prime Members. 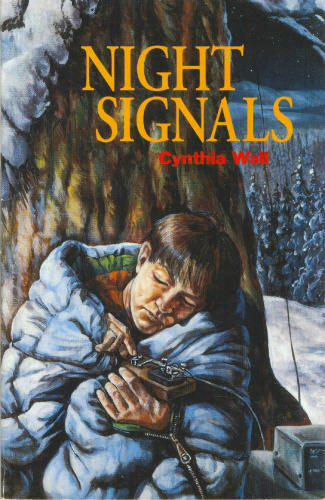 Other novels that my children and I have enjoyed are those written by Cynthia Wall, KA7ITT: Night Signals, Hostage in the Woods, Firewatch!, Easy Target, Disappearing Act, and A Spark to the Past. These six books are a series chronicling the adventures of fictional characters Kim Stafford, KA7SJP, and her boyfriend Marc, KA7ITR. They are definitely aimed at children, but if you’re like me you’ll still read them — it’s so hard to find novels incorporating ham radio that you just can’t pass these up. Another novel that incorporates ham radio is Cornbread Road, by Jeff Davis, KE9V. Mr. Davis released it as an audio-book in a series of podcasts in 2010-2011, and my wife and I enjoyed listening to it together. The podcast is not currently available but hopefully it will be back up soon. Cornbread Road is aimed at adults. The main character is a ham who gets involved with a secret society of ham radio operators led by a mysterious figure with a past, a ham who is an inventive genius and who is himself caught up in a web of international intrigue. While the plot may tax your ability to suspend disbelief, it is still an amusing story and throws in a little of everything in ham radio. Do you have any ham radio novels to recommend? I dimly recall one or two that I nearly wore out as a child (back in the days when I would ride my bicycle to the local library and read my favorite books over and over), but I couldn’t tell you much about them now. If you know of any — and where to find them — please chime in with a comment! As a pastor the months of December-January are the busiest of the year for me, so I haven’t done much with Ham Radio for weeks now. That is as it should be. As I’ve said before, we must keep our hobby in its proper place. But I haven’t let it completely die, and the hopper has slowly been filling up with things to share with you. One of those things is the ARRL’s online/mentored course, “Introduction to Emergency Communication.” I’ve registered for the next session of this course which begins on February 29 and runs through April 27. It cost me $50 as an ARRL member ($85 for non-members), but I think it’s worth the money in my situation. Not that I have to go through this course to learn the material. Much of the material may well be common-sense or a review of what I already know after being a ham for so long. The rest I could pick up by simply reading this book or (probably better) this book. Or I could glean it all from the web or learn it from an experienced member of ARES®. So why would it be worth $50 for me to go through a formal course of study? The answer: for credibility with governmental agencies. Like it or not, to gain respect from governmental agencies you need to prove that you’ve jumped through a few hoops — especially in a state like Minnesota. Several decades ago Minnesota figured out how important it is to train police officers well. As a former police trainer myself, I cringe when I see poorly-trained officers on COPS. Trust me — agencies that have invested in training are rarely interested in “help” from poorly-trained people, no matter how well intentioned. Furthermore, for certification to mean anything to governmental workers it needs to come from the biggest, most widely recognized institutions you can find. For ARES®, that means FEMA and the ARRL. I know some hams don’t like the ARRL, and I may get pelted with comments about how terrible the ARRL is. But there it stands. In order to register for this course you must first complete two free online courses offered by FEMA: IS-100.b, “Introduction to the Incident Command System (ICS 100)” and IS-700.A, “National Incident Management System (NIMS), An Introduction”. Whether or not you take ARRL’s course, you really ought to take these courses (especially the first one) if you ever want to participate in emergency services. I for one needed to brush-up on these things, and I appreciated how well they were done. Once you successfully complete these online courses from FEMA (they don’t take long) you may register for the ARRL course on the ARRL website. Registration closes on Wednesday, February 15 for the session I’m enrolled in, and on Wednesday, March 15 for the session that begins on March 28. There is still plenty of room in my session — of the 30 seats available, only 21 have been taken as I write this on February 4.